As I sit here writing this, I am staring at a stack of three books: “American by Day,” by Derek B. Miller; “November Road,” by Lou Berney; and “The Feral Detective,” by Jonathan Lethem. I have not read them yet. Despite lacking these potential contenders for stars in 2018, MBTB's “best of” list contains a whopping 18 TITLES. I mean to get to these three books, so don't be surprised by an addendum in the near future. I found this word in “Give Me Your Hand,” and it perfectly describes Megan Abbott’s newest book: ferocious. Megan Abbott can plumb the depths of darkness almost better than any current writer. She shades the darkness, where others merely paint it black. Her horror grows from an intensity that builds slowly. At the end, the other shoe drops as though there were a bomb inside. Two teenage friends become something other than friends as adults. But what are they to each other? The combination of metaphor, poetry, grittiness, and exposition of human foible and grace in “Green Sun” are hard to beat. (Plus, I don't often come across a crime novel that pays homage to the “rosy-fingered dawn” of “The Iliad.”) Hanson, star of other Anderson books, is now a cop in Oakland in the early 1980s. He is the master of disarming ignitable situations by himself. He quiets drunk bar customers and a crowd of screaming people with equal finesse. The dark can illuminate, if you are Kent Anderson. Innocent, acerbic 18-year-old Juliet Armstrong enters WWII with unformed ideals and gets caught up in a side eddy formed by the maelstrom that engulfs the UK. Atkinson’s dry humor, sly characterizations, and quirky storylines are worth every penny. Belinda Bauer could teach a master class in how to plot the unexpected. She takes every cliché and trope and trashes them. You think you know where Bauer is going because you’ve read sooo many crime stories, but you really don’t. You shake your head at what seems to be an obvious mistake or easy way out that Bauer has taken, and it turns out you are the one who deserves the head shake. The ace thief, nicknamed “Goldilocks” in Tiverton, England, is a 14-year-old boy who confounds the police. Set in contemporary Lagos, Nigeria, Oyinkan Braithwaite’s debut novel, “My Sister, the Serial Killer,” slams its way through to the end. Bam, bam, bam! There was great writing, careful construction, and a totally unexpected ending. And, in fact, Korede’s sister, Ayoola, is a serial killer. Two stories are braided together in this poetic and beguiling father-daughter novel. Anna discovers her father was a spy. Her desire to learn more about him leads to her own self-evaluation. Although the spy bits had substance, they weren’t overly meaty, and that’s good. Anna was Phi Beta Kappa, worked for the prestigious Ford Foundation, and had a mission and an independent life before marrying Jake. What is she now if she is not Mrs. Jake? The novel is also about Anna, and that’s good, too. Mason Buttle is a good, good boy. Moonie Drinker is a good, good dog. They make “The Truth as Told by Mason Buttle” shine like the sun. 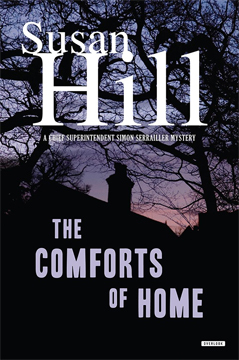 In the world created by author Leslie Connor, Mason is the tallest, sweatiest kid in the seventh grade in what was once a rural community that is now being overtaken by housing developments. He has dyslexia, synesthesia, and a sweet innocence. All of these personal characteristics have doomed Mason to a sad, shy life. The police keep coming back to ask Mason about the death of another young boy. What does Mason know? Tana French is Irish. She embraces her country’s mythos and quirks and produces book after book of brutal human nature combined with a touch of the fey. In “The Witch Elm,” childhood friends, now grown, must come together to solve one last mystery: Whose skeleton was tossed into the old wych elm? Let us return to now not-so-dry Australia, first visited in “The Dry,” with Federal Agent Aaron Falk. This time a woman who was spying on her employer for the police has disappeared. “Force of Nature” delivers a wonderful story, with flawed and human characters, especially that of Falk who is still trying to heal from the events of “The Dry.” On its own merits this book is strong and vibrant. The rains that spit, fall, and gust throughout the book play a malevolent background music. Okay, okay. This was published in 2017, but I didn’t review it until the beginning of 2018. It’s my list; I’m including it. One of the delights of “The Dime” is learning the derivation of the title. Betty Rhyzyk used to be a cop in Brooklyn. Now she tracks down bad guys in Dallas, Texas. She was tough in Brooklyn. She is tough in Dallas. Kent charges through her story with fast-paced action and solid characterizations. From the dead uncle whose advice Betty still channels to the grumpy colleague who constantly busts her chops, Kent makes the surrounding personnel three-dimensional with just a few strokes. Toggling between stories set in the late 50s and 1966, “Who Is Vera Kelly?” does not display a distracting and dizzying juggle. Rather, the earlier story lends direct coherence to the 1966 story. So refreshing. In 1966, Vera is a spy for the CIA in Argentina. She is smart, wily, and intrepid, but not foolhardy. Keeping to her mission to introduce us to other cultures, Sujata Massey presents her latest book, “The Widows of Malabar Hill.” It’s set mostly in 1921 Bombay, India. Perveen Mistry has had a long and rocky road to becoming the first female solicitor in Bombay. Perveen’s past story is heartbreaking and her present story is a triumph of stubbornness. This is an elegant debut novel. Unlike some of the more “literary” novels I’ve read lately, crime is at the heart of this book. Who is killing retirees in a southern Florida community? An odd combination of neighbors are the primary characters. 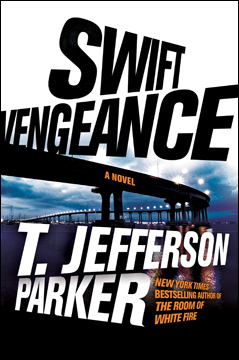 At the point when Owens resolves the murders, so much has broken free in these characters’ lives. That is the strength of her story. “The Chalk Man” is an impressive debut by British author C. J. Tudor. She takes well-used suspense tropes and twists them around. The result is a surprising story. Reminiscent of the group in Stephen King’s “Stand By Me,” the 12-year-old kids in “The Chalk Man” range through deep and dark woods, bicycle to each other’s homes, and work out a secret code to communicate. Several tragedies, including finding a dead body in the woods (you knew that would happen), hit them and their town. Then they grow up and the childhood story finds another chapter. The fictional town of White River is set in upstate New York, and it is burning because of race riots. The situation may become even more combustible if the murders of two police officers and two African-Americans are not solved. Call in Dave Gurney because he’s, you know, Dave Gurney. 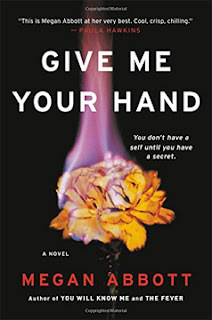 This is the sixth book in Verdon’s series, and it’s a winner. The events in this book take place a month after those in "Norwegian by Night," the first stellar book by Miller, in 2008. Miller covers American politics and social sensibilities through the eyes of a Norwegian visitor, Sigrid Ødegård. Sigrid is searching for her brother Marcus in upstate New York. Could he have killed his girlfriend before fleeing? 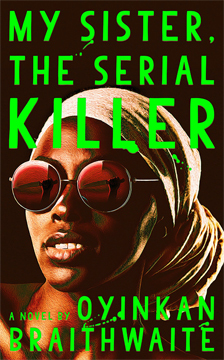 Set in contemporary Lagos, Nigeria, Oyinkan Braithwaite’s debut novel, “My Sister, the Serial Killer,” slams its way through to the end. Bam, bam, bam! The book begins with Korede helping her sister, Ayoola (the serial killer of the title), clean up after her latest killing. Luckily, relatively speaking, Korede is an expert at cleaning up. She has supplies. She is a nurse. She has nurse wiles at cleaning up. Soon after the body of Femi, Ayoola’s unlucky boyfriend, has been tipped into a river, she acquires her next admirer. She has no shortage of admirers. As Korede, the narrator of the book, ruefully observes, Ayoola is an extraordinary beauty and she, Korede, is plain. Their sisterly dynamics revolve around this point and often spin in centripetal furor. In Braithwaite’s excellently constructed story, pieces of the sisters’ past are slowly revealed. One of the most moving scenes is when Korede first glimpses her new baby sister. Ayoola is like a doll and Korede gasps when the “doll” stirs. Forever after, Korede and Ayoola are bound. MBTB star for great writing, careful construction, and a totally unexpected ending! I found this word in “Give Me Your Hand,” and it describes perfectly Megan Abbott’s newest book: ferocious. Megan Abbott can plumb the depths of darkness almost better than any current writer. She shades the darkness, where others merely paint it black. Her horror grows from an intensity that builds slowly. At the end, the other shoe drops as though there were a bomb inside. Abbott is a powerhouse. Kit Owens and Diane Fleming were two teenagers on the same wavelength when they met at summer camp. Each had the potential for brilliance. Over the years, they each proved their mettle and succeeded in the daunting world of science, as females, as young women. Mostly the story follows Kit, although Diane enters and exits the story often, some of it in flashbacks that finally allow us to see piece by piece unknowable complexity of their story. When they were teenagers, Diane confessed something to Kit that changed their relationship. Kit is held hostage to the confession. She leaves her small town, as does Diane, and Kit never looks back. It is only coincidence, she thinks, when Diane enters her life once more, into the safe and taxing world of the research lab of the renowned Dr. Severin. Kit is on track to become one of the chosen researchers to go forward with an important study on PMDD, super-sized PMS. (Blood of all sorts floods the pages of Abbott’s book.) Why do some women have such toxic and disturbing experiences during their menstrual cycles? Severin hopes to find out. Abbott twists her way into a story which becomes increasingly disturbing. Here’s a death. Wham! There’s a disaster. Bam! Here’s an unexpected outsider. Whoa! Things disappear, ghosts are spotted (or not), the camera, if there were one, would be tilting and viewing the story from unlikely angles, making for a dizzying viewing experience. Sometimes it feels like Diane is a corner of myself broken off and left to roam my body, floating through my blood. Don’t we all feel we have something banked down deep inside just waiting for its moment, the slow gathering of hot blood? Brilliant writing. Brilliant storyline. MBTB star! Caleb and Anton. Cal and Ant. Brothers in Melbourne, Australia. Raised in the little town of Resurrection Bay. How little was it? Everyone knows everyone else’s business. 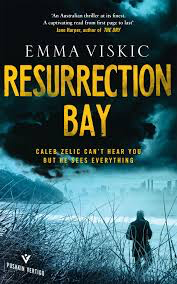 In “Resurrection Bay,” that both hurts and helps. Emma Viskic has crafted a tale full of noir touches, but also full of the frailty and kindness of humans. It’s a soft and hard book at the same time. That holds true for Cal Zelic, the hero of this story, and it holds for Francesca “Frankie” Reynolds, his partner, and Kat, his ex-wife. Anton has had problems with drugs. He may be straight right now, or he may be in thrall. What becomes an issue is whether he has had anything to do with the death of Gary “Gaz” Marsden, a cop and a childhood friend who freelanced with Frankie and Cal’s security services business. Caleb is found holding the body of his friend amidst a lake of blood. He has trouble communicating with the police, whom he called, about how Gaz called him and how he then found Gaz’ body. The confusion is not just because Cal is in shock but also because Cal is mostly deaf. He took years of speech therapy and people don’t realize he is hearing impaired. Cal is stubbornly vain about trying to communicate without signing. The police begin to look deeply into Cal’s potential involvement in Gaz’ death. Wait. What? thinks Cal, I didn't kill Gaz! It will be to his benefit to begin his own investigation, an investigation that leads to a lot of banging up of his psyche and his body. Frankie climbs on board and they begin with investigating just about anybody with whom Gaz had contact. Why had Gaz called Ant? Who called Gaz from a public payphone? Is Kat in danger? Was Gaz bent? Did “Grey-face” kill him? Who is Scott? What what what did Gaz get himself into? Someone is now after Cal and will use extreme means to get the information he has. But what information does Cal have, he repeatedly wonders. There’s also a slight bit of humor. At one point Frankie goes all kung fu on someone, leading Cal, the main character, to an inescapable conclusion. He had the same fighting style as a 57-year-old woman. Excellent. 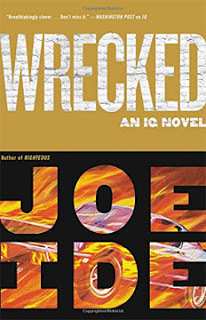 “Wrecked” is the third Isaiah “IQ” Quintabe novel. Joe Ide has infused more danger, anger, and violence into this book. Here’s an early warning, Abu Ghraib, that notorious prison/containment center in Iraq, features in this book. People were tortured and humiliated there, all in the name of international security. I will not speak to guilt or innocence or national policy, but if there was guilt in the holding cells, there was also guilt in the armed forces guarding the facility as well. Joe Ide jumps off of this idea into his story about what ex-military/agency people would be doing now, among U.S. civilians. Serious stuff for a series that usually has a strong humorous vein running among the tragedy and sadness. IQ is a Sherlock Holmes-like detective in a mostly black community of Long Beach, California. His self-appointed investigation partner, Dodson, is attempting to go straight while hanging on IQ’s coattails. Other eccentric characters introduced in the other books also make appearances. The gang’s all here. They are needed because IQ has committed to finding Grace’s mother. Grace is a young woman who seems as though she is carrying a big secret. IQ likes her a lot. She showed up in the last book, and in this one, she commits to hiring IQ to track down the mother who abandoned her ten years ago. It takes IQ a while to find out why Grace seems more intent on impeding his investigation than helping. Aha! It turns out Sarah, Grace’s mother, has a murder warrant out on her. The ex-Abu Ghraib team, chock-a-block with nasty, dysfunctional characters, is trying to find Sarah. Grace is trying to find Sarah. IQ is trying to find Sarah. All parties are set on a collision course. Why did Sarah murder her husband? Why is the team after her? How can IQ find a woman who does not want to be found, with the scant information provided by Grace, and up against the weapons, moves, and access to information the team has? There is a lot of violence, intimately described, in this book. I guess Ide really wants it to sink in that the torture techniques used in military installations to “get information” from prisoners was beyond brutal. Can any feelings of kindness and humanity survive in people who carried out inhumane acts? The team is joined by a non-military member: an ex-cop who has his own demons to fight and acts of cruelty to live down. Ghastly grisly group of ghouls vs. IQ. The best part of the book has to be when IQ unveils his McGyver-like arsenal. The worst has to be the going-over IQ is subjected to. Joe Ide gives, then slaps away. I read an ARC, a pre-publication edition. There were some oddities in it: a person who was in jail also taking part in surveillance on the outside at the same time, the vast emptiness of the lead villain’s mansion — where was the staff; maybe the villain did his own dusting and cooking and gardening. These were probably corrected in the final version. But this is the kind of stuff that throws me off; I’ll be both reading on but distracted at the same time by the puzzles. Nevertheless, the overall quality of this series compels the reading of each book. This is one of my favorite series. Juliet Armstrong, an earnest innocent, enters government work as an eighteen-year-old after her mother dies and she is left rudderless. The UK has not yet entered World War II, but it is only a matter of time she knows. She is catapulted — maybe that is too strong a word, since the work is tedious — into being a transcriber of recordings of an MI5 operation. In the apartment next to her small apartment/office, an MI5 operative is pretending to be a spy for the Gestapo. He meets with Nazi sympathizers. They tell “Godfrey Toby” all they have discovered about potential British maneuvering, and he passes the information along to … well, British intelligence. Then one of Juliet’s superiors asks her to pose as a sympathizer and infiltrate a group led by Mrs. Scaife, the nasty wife of a naval admiral. She is dogmatically related to all the ordinary but intolerant people who meet with Toby, but Mrs. Scaife’s social status is a step up. She is the link to all the other upper crust British fascists and to their misguided plots. Much later, as an aside, Atkinson follows up on one of the lesser lights in the conspiracy, Trude. She is dying, alone, in a hospital. A nurse importunes Juliet to sit with Trude, mistaking her for a friend. It would have taken the hardest heart — harder even than Juliet’s — not to feel a little sorry for Trude, but then Juliet thought of Fräulein Rosenfeld, who had lost all her prettier sisters to the camps. She stood up and said, ‘Well, this is goodbye, Trude,’ and left her to die on her own. That’s how Kate Atkinson rolls. Beatrice looked as though she had been modeled from clay, rather badly, and the clay had begun to deliquesce slightly. Someone had washed her, but the coal dust was ingrained in her skin, and her mousy hair was sooty. Something had already started nibbling at her and Juliet wondered what kind of creatures lived in coal holes waiting for this dreadful food. That eager-to-please, academic sixth-former, who played on the left wing in hockey, who was the leading light of the drama club and practiced piano almost every day at school (because there was no room for a piano at home), that girl who was a keen Girl Guide and who loved drama and music and art, that girl, transmuted by bereavement, had gone. And, as far as Juliet could tell, she had never really come back. Her war (and her peace too, she supposed) had been shaped by the men she knew. Oliver Alleyne, Peregrine Gibbons, Godfrey Toby, Rupert Hartley, Miles Merton. She thought they sounded like characters in a novel by Henry James. One of the later, more opaque ones, perhaps. Who, she wondered, was the most opaque of them all? ‘You have an eye,’ Miss Gillies told her. I have two, she thought. The book begins in 1981. Juliet has just been hit by a car. She sees the tunnel heading into the light. The rest of the book is the flashback of her life, a transcription, if you will, of her life. Imagine what could have been, instead of what was. Does she have regrets? Yes, she (and Frank Sinatra) has a few, including a major one that isn’t revealed until the end of the book. But then, in the shadowy world of espionage, everyone probably has a few. 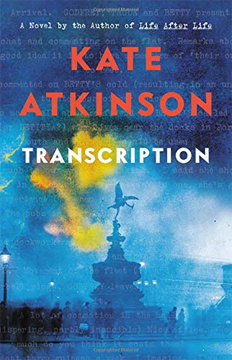 Kate Atkinson is a master of the hidden story. Her characters quietly hide in plain sight. Her story is defined as much by what she doesn’t say as what she does say. For the most part, the Mexican sun blazes unsparingly throughout “Depth of Winter,” the fourteenth full-length Walt Longmire mystery by Craig Johnson. It is easy to feel how parched various characters feel, how desolate the desert hillside is. In the midst of Dia de los Muertos festivities, Sheriff Walt Longmire of Absaroka County, Wyoming, has journeyed to the holdout of butchers and madmen in an almost inaccessible part of Mexico to make sure those dear to him do not join the spirits on the other side. Psychopath Bidarte has been a long-time foe of Walt. Walt suspects Bidarte has been behind the recent spate of evils that has befallen his family: the death of his son-in-law, the kidnapping of his daughter, Cady. Bidarte has left a trail for Walt to follow, a trail that ends in Walt’s death, Bidarte hopes. There is more action in this book than in all the previous thirteen books combined. It begins with Walt meeting “The Seer,” a blind man with no legs. Walt hopes he is the start he needs to find Cady. Walt must put his trust in this stranger. Then he must trust more strangers and even some bad people who are not strangers. Will the ghosts of the First Nation who have led and aided Walt in dire moments clear a path for him now? Will all the people waiting around the bend who want to kill Walt finally have the odds in their favor? Will the mules or donkeys help or hinder? There’s no telling with mules, or donkeys. 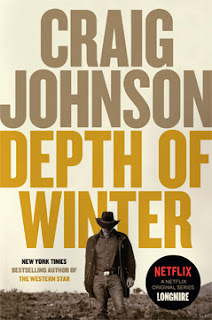 Despite the surfeit of action, Craig Johnson capably tends to his characters. He shows us their stories. He prods their better natures and tests their mettle. He also gives his long-time readers what they have come for: humor and heart. There is a lot of bang, bang. There are a lot of rat-a-tats. There are even some moments of ka-boom. There are cough, coughs. There are eeeeeeees, aaaaaaas, oh shits, and a clothesline. Good times. Two stories are braided together in this poetic and beguiling spy/father-daughter novel by Lea Carpenter. 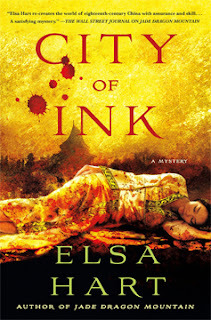 Much to her surprise, a young American woman, Anna, discovers her father, Noel, was a spy, mostly working in Asia. From that revelation flows a re-examination about their relationship: It wasn’t her, it was him. Her mother, Lulu, moved on to another life, abandoning her daughter and husband early on. Again, maybe it wasn’t her, maybe it was him. Still, revelations only beget more questions, and in the midst of that turmoil, Anna discovers she has married one kind of man and has gotten another. Anna is set to marry Jake (whose name doesn’t appear for quite some time, although he is important in moving events forward) in Switzerland, when Noel’s body is found buried by an avalanche just before the wedding. Noel had been visited by strangers just shortly before he headed up for a ski. Is there a connection? Anna doesn’t think about this for quite some time. On Anna’s long-delayed honeymoon, a man begins a conversation with her in a bar. He takes her to a beach where he invites her to swim far beyond the buoyed boundary. He reveals in a shadowy way his connection to Noel, who was his mentor at the shadowy CIA. Anna learns about a young Chinese woman who spies for her father and the unnamed colleague. Veritas is her code name. Who was she and what was she to both men? Is she why her father died in circumstances, come to think of it, that seem more sinister by the minute? Why has the colleague contacted her? He does not romance her but he acts with familiarity towards her. She responds with trust, although he has done nothing to warrant it. 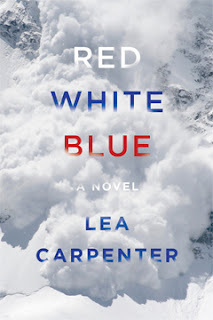 “Red, White, Blue” moves between the first-person narration by the unnamed colleague and Anna’s story told in the third-person. Noel’s career and obsession unfolds before us and before Anna. His still waters ran deep and with compassion. There’s a lot of talk about polygraphs and Wonder Woman’s golden lasso, both items that purportedly determine if someone is lying. Being fiction, the lasso is infallible, but the polygraph machine apparently is subject to interpretation and fiddling. The question that runs through the book is what is truth, what is truth-telling, and what is holding to the truth. In truth, veritas. As Anna’s story progresses, we see her husband, a golden boy with a golden touch, go from being an impressario in the pop music world to being a contender for U.S. Senator from New York. Anna’s own accomplishments begin to wane in the harsh beauty of his light, until she is no longer truly herself. The colleague’s intrigue draws her back into her own light long enough to assess what she wants to do to honor herself and her father. Although the spy bits had substance, they weren’t overly meaty, and that’s good. Anna’s story showed her fading out. She was Phi Beta Kappa, worked for the prestigious Ford Foundation, and had a mission and an independent life before marrying Jake. What is she now if she is not Mrs. Jake? The novel is about Anna, and that’s good, too. For the odd mix of spycraft and inner reflection, for an underlying story that touches the heart, for saving Anna, here is an MBTB star for Lea Carpenter!